It’s that time of year, Peeps time, so the iron crafters were challenged to create a Peeps themed project. I originally planned to do a diorama, but then the idea of some bright, high-impact pillows came to me. Ok, I love, love, love these. The Peeps have such a great graphic shape against the bright springy patterns. Using felt for the appliques made them super simple to do too. Really, the hardest part was finding three fabric to use as the pillows. Luckily, I looked in the home decor section and found these canvases. Later this week, I’ll show you how to make your own set with pdfs for the Peep appliques. 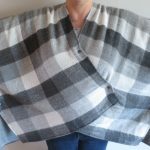 Leave a comment on this post to be entered to win. Make sure to leave a viable email address when you comment. If you want extra entries, feel free to tweet or write a Facebook status about the giveaway, then let us know in the comments you did. A random number generator will pick a winner on Friday, March 30 2012 at noon CST. The winner will get all three Peeps pillowcases. The prize does not include the pillow inserts to help keep the shipping cost lower. 7 years ago by Kat in Challenges , Easter , Giveaways and Contests , Holiday , Iron Craft | You can follow any responses to this entry through the RSS feed. You can leave a response, or trackback from your own site. Hello! 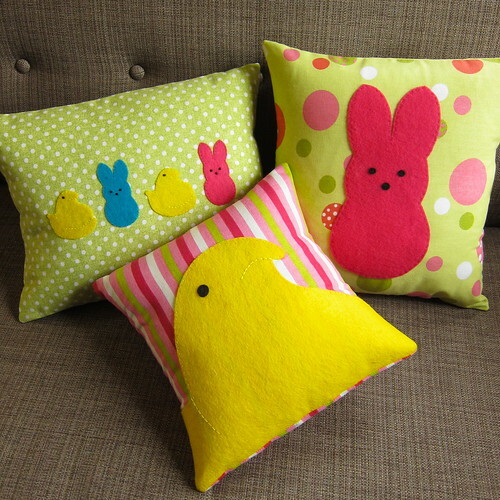 I just love these bright and cute peep pillows. You’ve inspired me to make something similar with Peeps as the inspiration for an Easter gift for my 2 1/2 yr old granddaughter! i LOVE YOUR PEEP PILLOWS.. MY KIDDOS WOULD PROBABLY TRY TO EAT THEM.. HEHE.. ENTER ME PLEASE.. THANK YOU.. HAVE A BLESSED DAY..
so cute! I love the different designs you came up with. I am a total peepaholic and those would look great in my house. I am making the bunnies this evening in peep pink. These are just amazing!!! We are a peep family for sure. Those. Are. Awesome! Great colors! Oh these are beyond cute!!! Shared on FB too! I would have even without a second chance to win! These are adorable…..so very cute for my little girl’s room. Damn cute!! Count me in….Good Luck to all! These made me squeal out loud…which is kind of embarrassing since it’s before 8am and I’m at work 🙂 Terribly, terribly cute! Love the pillows! Those colors are so cheery! 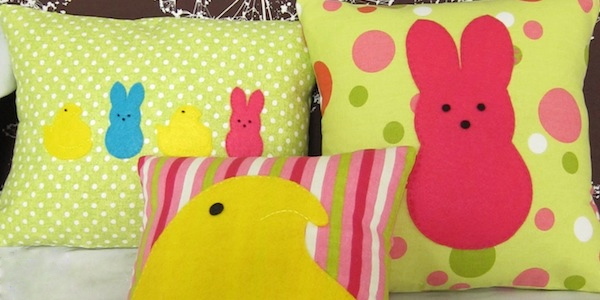 You know I love Peeps–and your pillows are darling! Who doesn’t like a Peep? Your pillows made me smile and I’ve been inspired to make a few plush peep for my nieces. I giggled when I first saw these. Spring has certainly sprung with these lil’ peeps! My little peeps would love these! so cute! 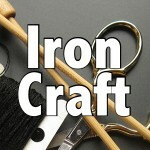 I can’t wait to get back into town to start doing the iron craft again! It has been way too hectic here. but i love these pillowcases! too cute! are you KIDDING?! These are TOO CUTE! Super adorable. Makes me hungry and comfy at the same time. Haha! I have been a “Peeps” fanatic forever! These would definitely get a smile from my family! Thanks for sharing your super-cute creation!! These are adorable! My favorite is the one with two bunnies and two chicks. Thanks for sharing and for the promise of a pattern if we don’t win!